We have an exciting opportunity for a Formwork Sales Engineer to join our UK national sales team, based in the Midlands, due to continued growth and business demands. 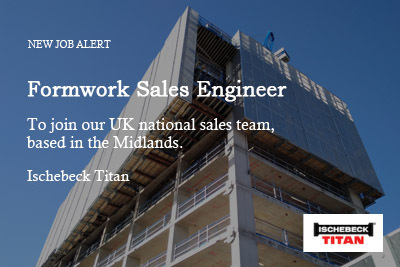 Our formwork sales team is at the frontline of our presentation to existing and potential customers and plays a vital role in ensuring we continue to provide the exceptionally high levels of sales and technical support for which Ischebeck Titan is renowned. The team also gathers market information and makes a major contribution towards the development of new products. If you can offer excellent sales and negotiation skills combined with a great personality and experience in presenting to the construction market, we would like to hear from you. If you feel that you have the skills, personality and drive for the above position you should apply in writing only via email or post, providing a CV and brief details of how you feel you can add to the success that Ischebeck Titan has achieved to date.